LANSING — The campaigns of 50 percent of current state lawmakers have paid fees for failure to comply with the state’s campaign finance reporting requirements. The fundraising committees of current lawmakers have paid nearly $100,000 in penalties over the lawmakers’ political careers for filing reports late or similar missteps, according to a review of state campaign finance records. The individual fee payments range from $10 for filing required notices a day late to $6,950 for a range of violations including filing disclosures a month late and for not reporting other contributions properly. 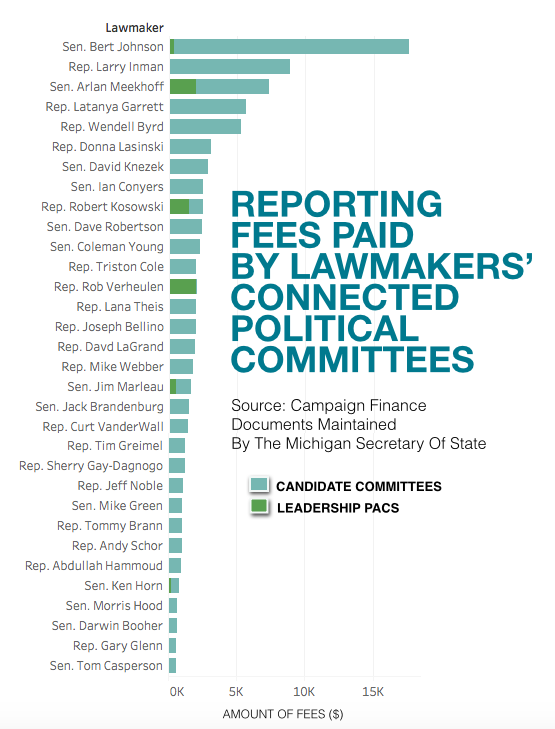 MCFN compiled the data by reviewing the campaign finance reports of each lawmaker’s state campaign committees — both current and past — and their connected political action committees (PACs). Some lawmakers who served in the House for six years and later moved to the Senate have been filing reports for about two decades. Others serving their first terms in the state House began filing reports last year when they first launched House campaigns. 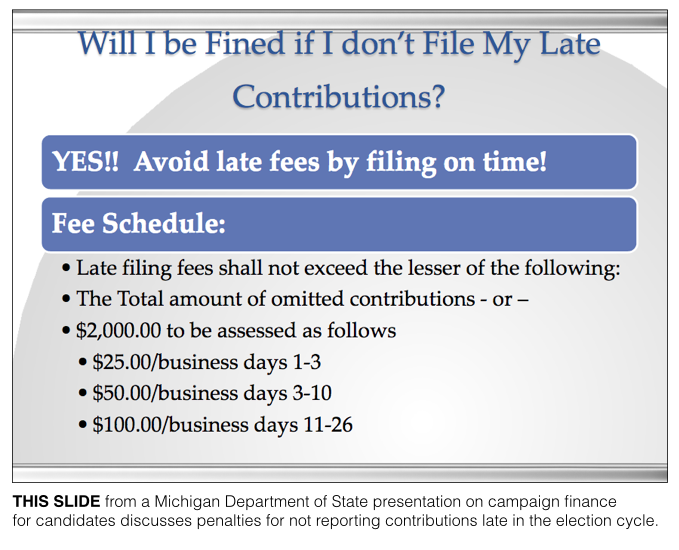 The Michigan Department of State imposes fees when campaigns file their required fundraising reports late or make similar errors in disclosure. Records of fee payments are available to the public. Fee payments that were later refunded by the state aren't included in MCFN's tracking. Of the 146 current lawmakers in Lansing — there are two vacant seats in the House — the committees of 73 lawmakers have paid fees for reporting missteps at one point in the lawmakers’ careers. The 73 lawmakers whose committees have paid fees have handed over $97,145 total for various failures to meet reporting deadlines. However, the committees of just 10 current lawmakers have paid the majority of the fees. The committees of the 10 lawmakers with the most fee payments have paid $57,824 over their careers. The committees of one lawmaker, Sen. Bert Johnson, a Democrat from Highland Park, has paid $17,595 in fees over his career, according to state records. Future penalties for certain violations of the Michigan Campaign Finance Act could increase if a new bill, House Bill 4216, becomes law. The bill introduced by Rep. Mike Webber, a Republican from Rochester, would increase maximum civil fines in certain situations from $1,000 to $3,000. In a press release about the bill, Webber said the bill’s intent is to boost accountability by showing who is funding elections in Michigan. House leadership referred the bill to the House Elections and Ethics Committee, of which Webber is a member. McNamara said Webber has requested a committee hearing. According to MCFN’s review of public records, no current state lawmaker’s committees have paid more fees for campaign finance reporting missteps than Johnson’s committees. He is in his second term in the state Senate, having previously served in the state House. Johnson is currently facing charges of theft and conspiracy involving allegations he hired a ghost employee to work in his Senate office. Johnson’s campaign committees and leadership PAC, the Consensus PAC, have combined to pay $17,595 in fees for reporting missteps over the years, and more could be on the way. The PAC hasn’t filed a fundraising disclosure since July 25, 2014, missing 11 quarterly reporting deadlines, according to state records. Johnson’s campaign committee for the Senate has missed the last four reporting deadlines, having not reported any contributions since the end of 2015. In 2016, other PACs reported that they gave Johnson’s candidate committee $3,700, including $600 from DTE Energy, according to campaign finance records. Johnson’s campaign committee hasn’t reported the contributions. Johnson’s office did not respond to requests for comment on this story. 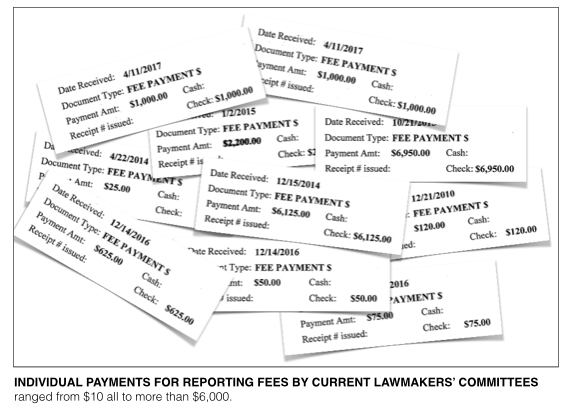 The candidate committee of Rep. Larry Inman, a Republican from Williamsburg, has paid $8,875 in fees, the second highest amount of any lawmaker’s committees, according to MCFN’s review of records. Inman said his high fee payments were because of an error by himself and his staff during his first campaign for the House in 2014. Inman said his treasurer and he didn’t know that loaning money to your own campaign had to be reported under those late-reporting requirements. Inman's committee hasn't faced any fees since those imposed in 2014. As the law requires, the Michigan Department of State requires fee payments from candidates if they don't properly report contributions they receive in the late-contribution reporting window. The fees are based on how late the reports are filed. Following Rep. Inman on the list of House members who have paid the most fees is Rep. LaTanya Garrett, a Detroit Democrat who is currently serving her second two-year term. Garrett's candidate committee has paid $5,680 for reporting missteps, stemming almost exclusively from late filings and inaccuracies in her campaign contribution disclosures, according to state records. In January, the Bureau of Elections sent Garrett’s campaign a letter, noting that she didn’t report receiving four contributions totaling $2,500 that other PACs reported they gave her campaign. Her office has not responded to a request for comment.